It’s safe to say that Marvel’s sale to Disney hasn’t changed the comic book company’s game plan with regards to its superhero movies. Tony Stark, thankfully, isn’t taking surprise trips to Disneyland in the Iron Man sequels. In fact, those not clued into the industry might not have even noticed that the House of Mouse on the House of Ideas had even merged at all. Now enter Disney’s Big Hero 6, which seems to be the first real glimpse of cinematic collaboration between the two media giants. Take one of Marvel’s lesser-known D-list superhero teams, sprinkle some CG Disney magic on top, and here we have a guaranteed crowd pleaser. The story follows Hiro Hamada, a young robotics genius who must team up with his gaggle of nerdy friends to save the Franken-titled city of San Fransokyo. 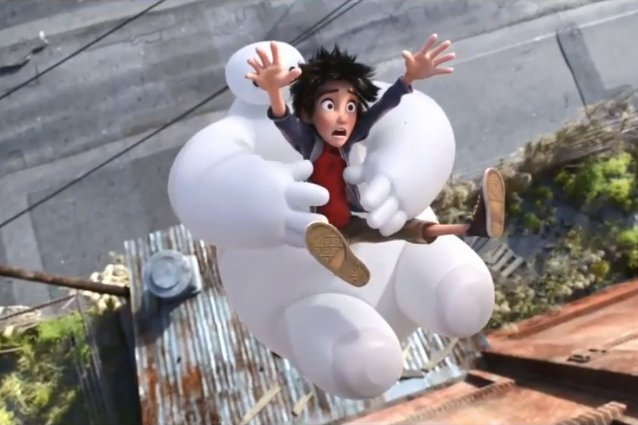 By Hiro’s side is Baymax, a peaceful nurse robot juiced up with armor and other crime fighting upgrades. The trailer is cute and charming in that Disney way, but there’s also glimpses of the standard high-flying Marvel superheroics. There are plenty of great physical gags stemming from the fact that Baymax is really just a giant white blubbery balloon… thing. Since Marvel’s Avengers universe seems to be getting darker and less kid-friendly by the minute (The Winter Soldier literally threw that one guy in front of a freakin’ truck in the last Captain America), Big Hero 6 might be a nice stopgap for young kids looking to release some adrenaline, but not looking for daily nightmares of Sebastian Stan.